Back from a “find the sun” weekend. Man, what a crap summer this has been. Enough whining, back to the business at hand, a song. 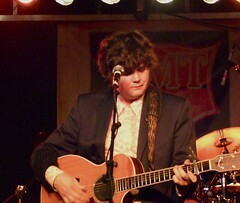 In this case a Canadian singer with huge world-wide influence, Ron Sexsmith. Thirteen albums since 1991, recording since he was 21, first band at 14, huge stable of musical admirers. These include, Chris Martin, Paul McCartney, Elton John and Elvis Costello. His songs have been recorded by many as well. His tune “Secret Heart” has been recorded by Feist, Rod Stewart and Nick Lowe, pretty diverse group. Heard this tune while city in my usual discovery place, the driver seat of my car on the way to work (love Shazam, best app ever), and loved it.The song is from his latest album “Forever Endeavour”. Nicely crafted song. Enjoy. This entry was posted in Canadian Music, Music, Singer Songwriter, Song Of The Day and tagged Canadian Music, Music, ron sexsmith, Singer-songwriter. Bookmark the permalink. Wouldn’t mind seeing him on a double bill with Jake Bugg. Love Jake Bugg. Great stuff for a teenager. Did a post on him a while and planning another. My niece in England turned me on too him.